Friday January 31st 1908 I did the ironing in forenoon and got the dinner early. Will went down town in afternoon. He did not stay long for it began to snow. I finished Lydias pillow cases with the tatting they are very pretty. I will work on my own now. The home folks are busy with sewing girls. Saturday February 1st 1908 The wind began blowing in the night and today was something terrible We could not keep the house warm at all. Had to eat in the sitting room. The boys took care of the stock the best they could. I made a little tatting. Sunday February 2 1908 It is still cold. I was busy with the work all forenoon I read from an old diary part of the afternoon and wrote a long letter to Lou Reeves Simpson. Read in evening. 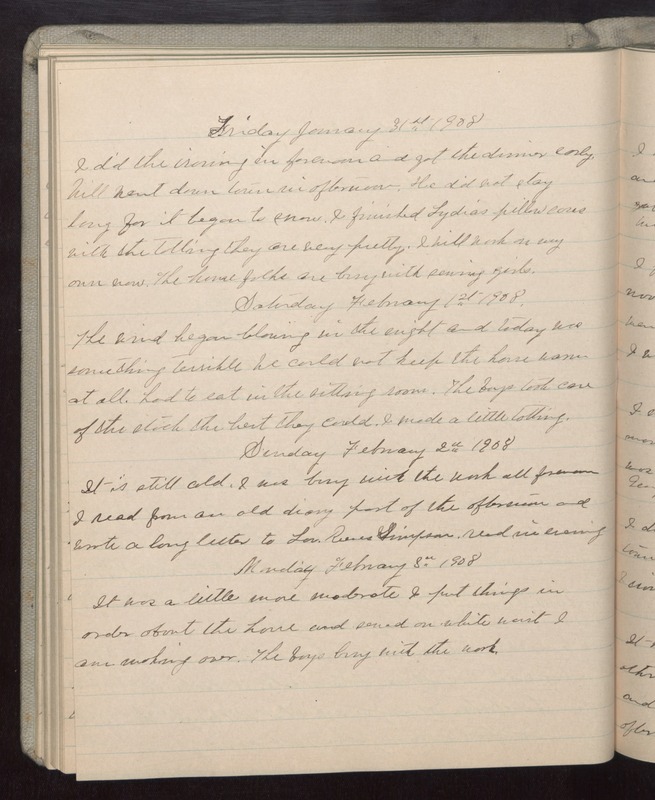 Monday February 3 1908 It was a little more moderate I put things in order about the house and sewed on white waist I am making over. The boys busy with the work.